Item #: KR-808654 | Up to 2 lines and 5 characters per line. Price includes engraving. Quantity Discounts Available. Price Includes Engraving On 1 Side. 3-5 Days Production. Enter Details Below..
Tag Type: .060 in. Thick Solid Brass (raw brass). 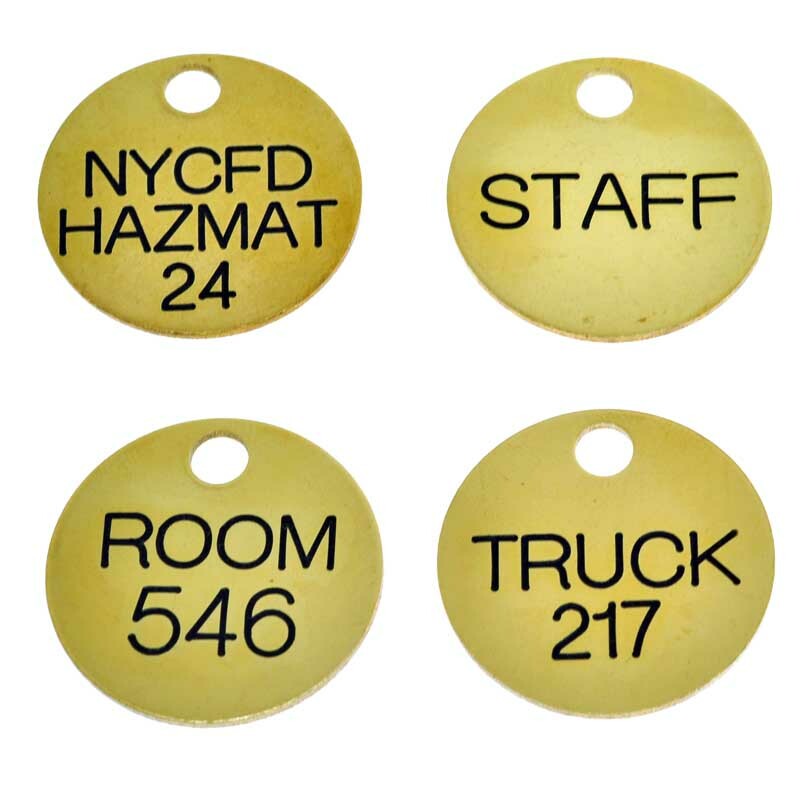 .060" Thick Solid Brass Round Key Tags. 1 1/4" Diameter Round Brass Tag. The Brass is bare and unfinished, it will tarnish over time. Perfect for sorting many keys. Available in bare brass or filled with black enamel paint. Item #: KR-808654-NUM | Sequential Numbers ONLY. Price includes engraving. Quantity Discount Available. SOLD AND PRICED EACH. Tag Size: 1 3/8" High x 2 1/2" Long and .050" Thick Anodized Aluminum. Tag Size: 1 1/8" High x 1 1/8" Long and .050" Thick Anodized Aluminum. Tag Size: 1 3/16" High x 2" Long and .050" Thick Anodized Aluminum. Price includes your personalized text or wording on FRONT side, up to 7 lines. Minimum 12 Pieces-ALL IDENTICAL. No Setup Fee! Leatherette Key Ring. Price Includes Your Personalized Message Engraved On 1 Side. Powder Coated Metal Key Ring. Price Includes Your Personalized Message Engraved On 1 Side. Anodized Aluminum Key Ring. Price Includes Your Personalized Message Engraved On 1 Side. Leather with Brushed Silver Key Ring. Price Includes Your Personalized Message Engraved On 1 Side.